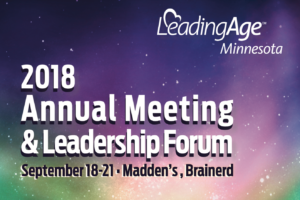 Pathway Health is a proud Tee Box Sponsor of the LeadingAge Minnesota 2018 Annual Meeting & Leadership Forum September 18-21. This premier leadership conference aims create a space where bold leadership can take shape, new innovative ideas can form and excellence can be pursued. Attend Leah Killian-Smith’s session, “Quality and the Evolving Post-Acute Care Landscape,” to be presented September 20 from 1:30 p.m. – 2:30 p.m.
We’ve saved the best for last; connect with the Pathway Health team September 18 at Hole #18 on the golf course. We can’t wait to see you there!